Throughout time many differently ethnic cultures have given life to celebrations that today we would consider carnival-like, even though the origin is generally attributed to the Roman Baccanali. These were a form of furious carnival in which citizens, drunk on wine, would go around the city yelling, singing, and with their faces painted. The ancient Romans also celebrated Saturnalia a festival in which they would honor the god Saturn in hope of achieving an abundant harvest. Celebrations included feasting, gift giving, drunkenness, big meals and pranks. Masked parades of merrymaking featuring young boys and girls dancing on allegorical floats were held through the streets of the cities. In ancient Greece, floats were used for the yearly celebration in honor of Dionysus, the god of wine in hope of a successful breeding amongst the animal stock. The idea of the first allegorical floats was developed under Pope Alexander VI (1492-1503). Sicily saw its first allegorical float in March of 1601 in Palermo. The float resembled Neptune (god of the Sea), and had people dressed up as sirens dancing around it. 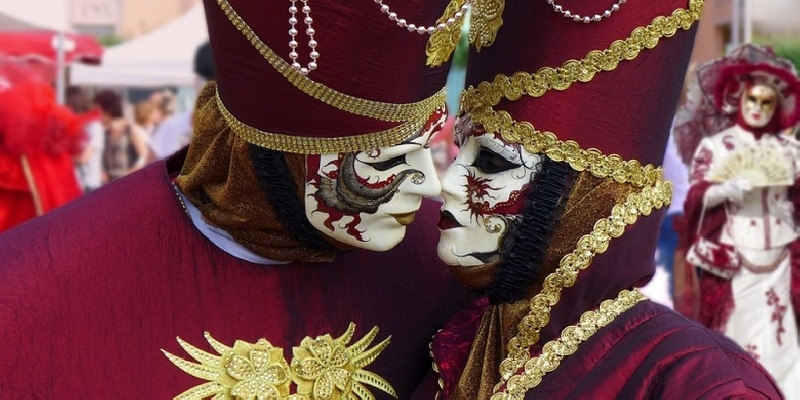 Today, the carnival stays true to its origins, with the masks, the floats, and the overall feeling of fun and partying. In older times people used to throw eggs or vegetables at each other and at things as part of the celebration. Today, people throw the “lighter” confetti (pieces of paper cut up from old newspapers or random colored paper). Foam spraying has also become a sort of “sport”. The floats today not only have vivid colors and shapes but also use an advanced system of lighting that brings more life to the floats.